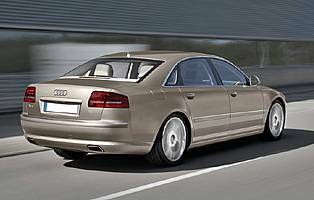 The Audi A8 has succeeded in the premium executive class like no other Audi before it, offering a seductive blend of style, luxury and performance. Despite new rivals in the sector the A8 has remained popular, yet Audi has introduced a revised version designed to keep it at the top of the class. At first glance the revised A8 looks little different from the original, retaining the taut lines and discreet, muscular styling that contrasts sharply with some of the more challenging efforts from rival manufacturers. There are external changes however, but these are limited to a single-frame grille, LED tail-lights and new door mirrors. New exterior and interior colours give greater choice to buyers, but clearly the A8 needed few adjustments to keep it looking fresh. Elsewhere the A8 has undergone a series of refinements to improve performance in all areas. 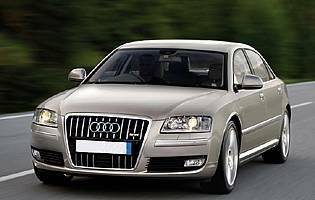 The suspension and steering have undergone minor changes to improve both ride quality and handling, while changes to sound proofing have reduced noise levels still further, making the A8 one of the most quiet and refined cars ever made. The A8 already has an enviable safety record thanks to its clever aluminium construction and numerous safety systems, but the revised A8 takes this further with the addition of some clever features. Audi side assist uses radar to monitor the common over the shoulder blind spot, and illuminates LEDs mounted in the door mirror if a car moves into this critical zone to warn the driver. Additionally, lane assist vibrates the steering wheel to warn the driver if the car drifts starts to cross lane markings without signalling. 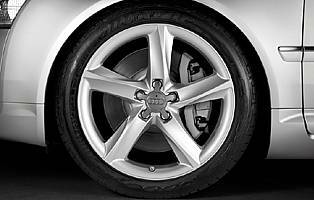 The comprehensive engine range remains largely unchanged, save for the introduction of the 2.8 model. Using FSI and valve lift technology, the 2.8 version is matched with a front-wheel drive only configuration and the CVT multitronic transmission it claims to deliver the best fuel consumption and lowest C02 figures in class. The A8 was already a highly capable and rewarding machine to use, so the revised version had a tough job to improve. Yet the subtle changes have enhanced its appeal, particularly the 2.8, offering the same high levels of luxury and decent performance but with very respectable green credentials.